The VE-8 Acoustic Singer combines essential sound tools for vocals and guitar with extended creative features, enabling you to deliver great-sounding performances that stand out from the crowd. BOSS knows that you need to dial in sounds quickly and easily, without any hassles or distractions on the gig. The VE-8 has been designed with this philosophy first and foremost, presenting you with a straightforward interface that’s very intuitive to use. In many cases, pushing a button or twisting a knob adjusts multiple effects parameters at once under the hood, letting you achieve sophisticated results with minimal effort. After creating a setup you like for a particular song, just save it in one of 50 memory locations for instant recall. With the VE-8’s three built-in footswitches, you have direct effects control while performing, and one or more optional footswitches can be connected for further control if needed. The VE-8 Acoustic Singer and CUBE Street EX amplifier create a powerful battery-powered performance rig that you can use anywhere. The VE-8’s vocal channel provides a full complement of tools to make your voice sound fantastic. Four types of reverb effects are on board, plus an Enhance feature to add clarity and control to your sound. Pressing the Correct button enables automatic pitch correction, which transparently keeps your vocals in tune with ultra-fast processing. This button toggles between three settings, and the light tells you which one is active: green for soft correction, red for more aggressive correction, and off for bypass. There’s also a sophisticated EQ with low-cut filter available if you want to dig a little deeper in shaping your sound. The three-band design with parametric midrange lets you tailor the tone for any venue, and the low-cut filter is very handy for eliminating low-frequency boom caused by mic stand vibrations. 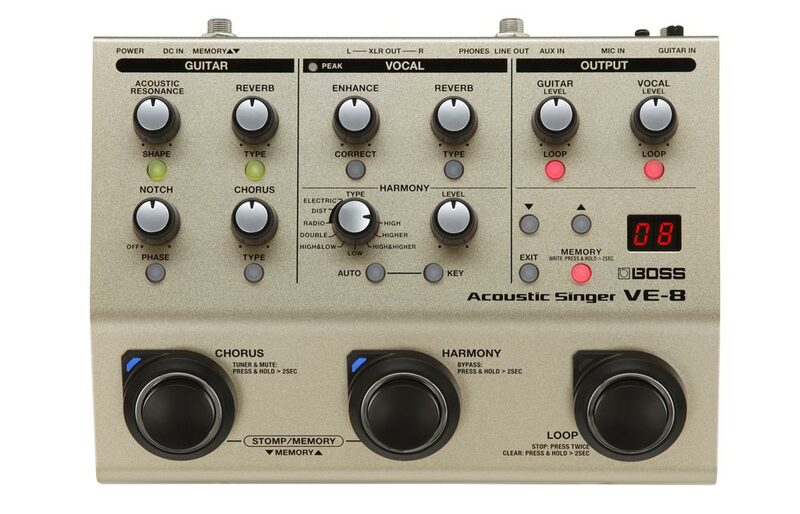 The VE-8 Acoustic Singer is compact and intuitive to operate. As the name suggests, the Harmony section on the vocal channel includes the VE-8’s real-time harmony functions. With the Type knob, you can choose from among five different natural harmonies. The selection includes various one- and two-voice combinations that are suitable for many different music styles. 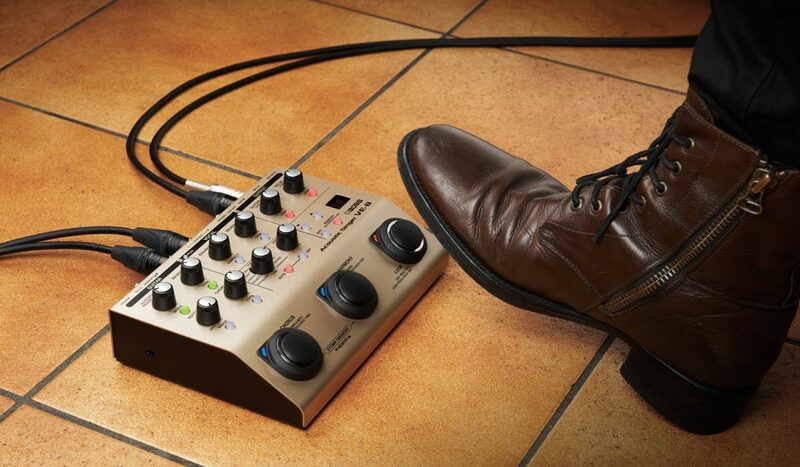 To bring the harmonies in and out as you need them, just press the dedicated Harmony footswitch. The Auto button toggles between three settings that determine how the harmony function behaves. When the button is red, the harmonies follow the chords you play on a connected guitar, making it simple to get perfect harmonies automatically. When the button’s light is off, the harmonies will follow a preset key that you’ve manually set. Hybrid mode is active when the button’s green; this mode follows the guitar input when you’re playing chords, but reverts to the manual key setting when you’re soloing or not playing at all. The rear panel of the VE-8 Acoustic Singer provides versatile connectivity. The Harmony section includes some alternate processing options as well. A doubling effect is available, which is perfect for adding fullness and presence. Hard-tuned electronic voice sounds, distortion, and radio voice tones are on hand as well, great for bringing some variety and edge to acoustic performances. The VE-8’s dedicated guitar channel is completely independent from the vocal channel, and delivers all the tools you need to get excellent live tones with an acoustic axe. Acoustic Resonance does wonders with typical undersaddle acoustic pickups, replacing harshness and piezo “quack” with rich, natural tone. Like the vocal channel, a three-band parametric EQ with low-cut filter is also available to further refine your sound if needed. With the Reverb section, you’re able to dial up four types of great-sounding ambience effects. The Chorus section defaults to the classic BOSS chorus effect, which nicely enhances any guitar sound. With a press of the Type button, you can toggle through a variety of alternate BOSS effects like Octave, Mod Delay, Slow Gear, and others. Other useful tools for stage performing include a built-in guitar tuner, plus a phase switch and notch filter for instantly dealing with any feedback issues. Looping offers a powerful way to support solo performances with background rhythms, counterpoint, and more. The VE-8’s looper is always available via a dedicated footswitch, and you can quickly select your guitar, voice, or both for looping with panel buttons or an optional external footswitch. The VE-8’s looper is always ready to go. 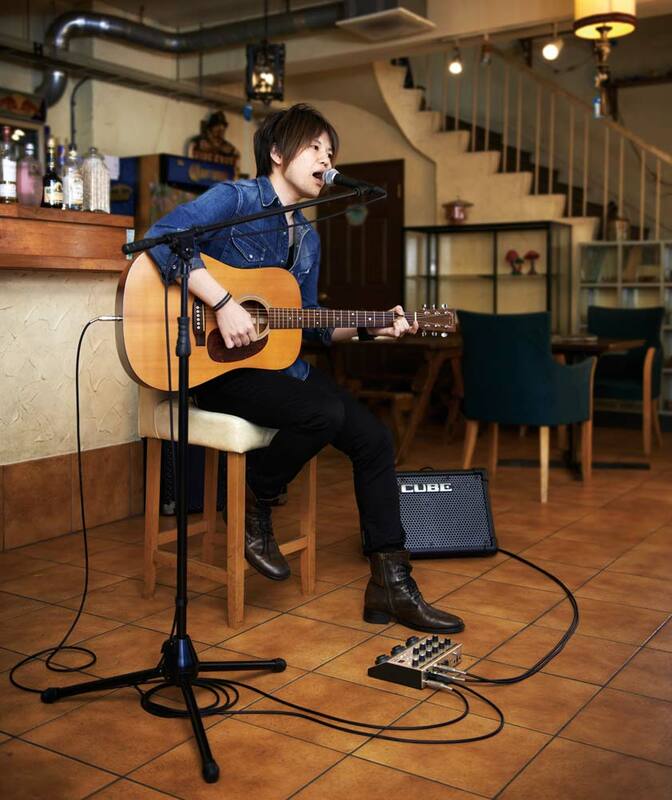 The VE-8’s rear panel is equipped with a standard guitar input and XLR mic input. 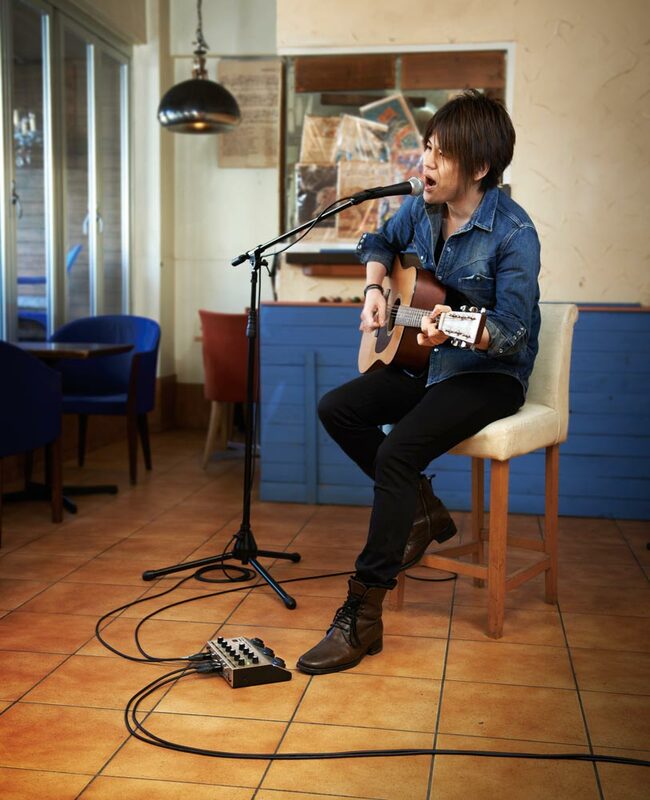 The mic input has switchable phantom power, allowing you to use a high-quality condenser mic on stage. There’s an Aux input too, perfect for connecting a smartphone or music player for backing tracks or break music. Stereo XLR balanced outputs provide a direct feed to the house PA, while stereo 1/4-inch outputs let you send a separate signal to stage monitors or an acoustic amp. It’s also possible to send the vocal and mic channels to separate outputs; this feature is particularly useful when you’re playing bigger gigs where a soundman can balance the sound from the front-of-house position as you play. Finally, the VE-8 also functions as a USB audio interface for your music recording software. Paired with a laptop computer, this makes a great mobile recording rig, allowing you to capture stage performances and work up musical ideas anywhere you go. To learn more, visit the VE-8 product page. The VE-8 Acoustic Singer provides top-quality processing in a compact package that runs on batteries.